With multifamily sales increasing and the market changing, you may be looking for someone to deal with processing, evaluating and analyzing your transactions. With previous methods being far less thorough, ResiModel does it right. From helping the Broker with underwriting all the way to their novel method for processing rent rolls, they are raising the standards of excellence in the real estate field. With countless testimonials praising the company, they welcome a new round of funding and discuss it with the AlleyWatch team. In anticipation of our raising a Series A round, several new investors and a number of our existing investors funded approximately $500,000, bringing the total amount raised to date to about $4 million. What is so exciting about this is the caliber of people that have that backed us. For example, Symmetrical Ventures, a VC firm headed by Paul Audet, the former CFO of BlackRock, invested in this round. Paul is a thought leader in the worlds of finance and real estate, so having him back ResiModel really affirms that he believes in us, which we think is very telling about our platform’s capabilities. Investors in this round also included several investors that had backed ResiModel previously. As we ramp up our operations, it’s great to know that these key stakeholders are interested in continuing their relationship with us. 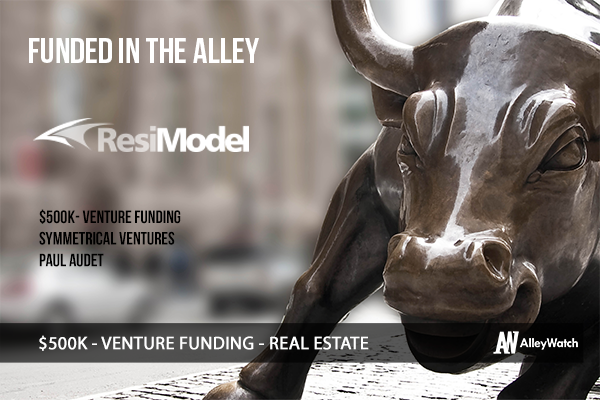 ResiModel is the leading platform for capturing, processing and analyzing financial data for multifamily transactions. The platform provides the ability to share detailed rent rolls and historical operating statements between brokers, buyers, sellers, and lenders in a standardized, electronic format. It also includes sophisticated data visualization and analytics tools that enable users to gain deeper insight into properties they are analyzing. A few months ago, we rolled out a really exciting new capability that our users love, called Rent Roll Capture™. This feature takes rent rolls created in PDF and Excel files and extracts the data, converting it into a digital format that’s easy to analyze. And it does this in seconds; if someone tries doing it manually, it could take 1-4 hours depending on the specific format, so you can understand why our users love this feature. Like many companies, this one was started out to solve a problem that I personally experienced when I worked on the real estate teams at JP Morgan, Citigroup and Sequoia Debt Ventures. I was analyzing potential investment opportunities and was frustrated about the lack of a standardized format for the data (i.e. rent rolls and operating statements). Instead, way too much time ended up being spent to enter data into our own templates. Since all the files were then saved in network drives, it was hard to access for future analysis. ResiModel allows users to capture, process and analyze all of the data that they possess – and then share it with other relevant parties in a standardized, electronic format, effectively doing for privately-held multifamily operating data what Bloomberg has done for publicly-available company data. Our application applies data visualization and other analysis tools to provide deeper insight into deals than people can typically obtain solely through Excel models. Additionally, because the data is digitized and stored in each client’s own secure account, they can easily compare operating metrics to identify outliers and upside opportunities. ResiModel operates in the multifamily real estate transaction space. There are roughly $250 billion of multifamily transactions in the U.S. each year. We have a subscription model. Our basic subscription provides data aggregation, standardization, analytics and Rent Roll Capture. We also have an upgraded subscription option that takes all of this data and generates cash flow projections (i.e. we’ll project the cash flow for the apartment building you’re considering purchasing). Why is your business defensible and not a feature for a larger company? As a company, ResiModel’s purpose is to standardize multifamily operating data that firms share with one another and eliminate non-value-add data entry work. All the large real estate companies do each have their own formats for real estate data; that’s the very problem. As an independent company, we have been able to create a platform that is used by many parties across the industry – which is what is necessary to create an industry standard. Like any process, it involved having a compelling story and building momentum. The original investors saw the vision and understood the need for standardization in the multifamily space. The more prominent investors we attracted, the easier it became to attract other industry leaders to our venture. In the early stages, the main focus is driving growth. In the meantime, the need to raise capital is equally acute. Fundraising can be extremely time-consuming and, frankly, somewhat distracting for senior management. It can be a bit challenging to simply find the time to raise capital while also ensuring that you’re successfully running the company and executing your business plan. What factors about your business led your investors to write the check? Many of our investors are very familiar with the space in which we operate. Paul Audet, who I mentioned earlier, oversaw the US Mutual Funds, Global Real Estate and Cash Management businesses at BlackRock earlier in his career. So he’s aware of the benefits of standardization in this space, and he feels that our solution is a very compelling one. Other investors include the former head of JP Morgan’s global real estate portfolio strategy, the former Chief Investment Officer at Deutsche Bank, and the CEO of a multifamily REIT. We’ve also been successful at signing on many high-profile clients including several of the 50 largest multifamily property owners in the country. When you’re able to point to traction like that, investors recognize that you have a product with a lot of potential. We’re currently focused on growing our user base and continuing to enhance the functionality offered by our platform. To enable this growth, we have begun talks with several venture capital funds. One thing that’s very important for entrepreneurs to realize is that you can’t do everything at once. The road to success involves creating something relatively simple and seeing how the market responds. This will save you an enormous amount of time and allow you to ascertain the true value proposition much more quickly and cost-effectively than other firms with deeper pockets. Now that we have gained rapid traction in the buyer and seller space, we are beginning to shift our focus to lenders. Given the volume of transactions that they underwrite, lenders–more than anyone–can benefit from the significant time-savings and analytics capabilities that ResiModel offers. Previous How Much Capital Should You Raise?